RIO DE JANEIRO, BRAZIL – Nestled to the east of Botafogo, Urca may not seem the center of all the action like Ipanema or Leblon, but that is exactly what makes it so charming. Its secluded, small-town feel, paired with a close proximity to the Centro, makes Urca seem the best of both worlds. 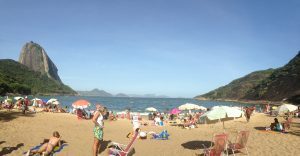 Praia da Urca, or Urca beach, offers sunbathers a stunning panorama of Guanabara bay, photo by Mary Bolling Blackiston. Tucked on a small peninsula, away from the hustle and bustle of Rio, for many there is only one word to describe this hidden gem neighborhood: tranquil. Part of that tranquility derives from the fact that Urca is one of Rio’s safest neighborhoods, thanks to the presence of a military base and general lack access. Not only is Urca the home of Pão de Açucar (Sugarloaf Mountain), but it also boasts three quiet beaches, numerous rock climbing routes, low-key restaurants and bars, various walking and hiking trails and a calm oceanic bay. To top it off, Praia Vermelha (Red Beach), adjacent to Pão de Açucar, arguably has one of the most stunning panoramic views in all of Rio. The pista Cláudio Coutinho (Cláudio Coutinho trail), located to the side of Praia Vermelha and encircling the base of Morro da Urca (the first hill on the way to Pão de Açucar), is a popular place to go for a stroll. Surrounded by an abundance of exotic fauna and flora and inhabited by monkeys, birds and butterflies, visitors of this two-kilometer trail are immersed in nature as well as stellar views. For those who crave even better views (and a more vigorous workout), hiking up Morro da Urca is a popular alternative to riding the Pão de Açucar cable car. Yet serene walks and hikes through jungle-like surroundings are not the only perks of Urca. Bar Urca is a popular hangout spot among locals on the waterfront of Guanabara Bay, photo by Alexandre Macieira/Riotur. The picturesque Baía de Guanabara (Guanabara Bay), dotted with colorful boats set against a backdrop of Rio’s ever-present mountains, also grants spectacular views and provides a calm escape from tourists and bustling city-life. The winding promenade that runs along Baía de Guanabara is frequented by fishermen, joggers, bikers and casual strollers, and is lined with a number of restaurants and bars. Praia da Urca, one of the beaches along the waterfront, is often filled with residents exercising, kids playing soccer and people canoeing and kayaking. At the end of the waterfront lies the off-the-beaten-path bar and restaurant, Bar Urca, where customers sit along the seawall that lines the bay, savoring the view and indulging in the Carioca drink of choice: an ice-cold beer. While Bar Urca is a bit pricey (about R$10 for a bottled beer), the atmosphere can get lively and it does afford an incredible view, especially at sunset. Although Urca may feel a bit disconnected from the rest of the city, there is no shortage of transportation. There are several buses running through the neighborhood, both along Baía de Guanabara and to Pão de Açucar. Rio Sul shopping mall is within close walking distance, as well. Despite, or because of, its relative isolation, this residential neighborhood has not been cocooned from the sharp increase in real estate. According to Zap.com.br, the current average price of purchasing a one-bedroom apartment in Urca is R$800,000, up from R$ 400,000 in 2011. For a two-bedroom, the price climbs to R$1.5 million and for a three-bedroom, it is R$2 million. To rent a one-bedroom apartment, the average price is R$3,500, up from R$2,000 in 2011. A two-bedroom averages at R$4,500, while a three-bedroom is R$6,500, not including condominium fees and taxes. Sounds like a lovely place to live or visit! Thank you for the great article!